With the first significant snowstorm of the season predicted to hit Brewster this weekend, we would like to remind local businesses of ADA regulations in regard to parking and store access. Please remember to maintain the accessible parking spaces and pathways on PRIVATE and TOWN-OWNED business properties. All accessible parking spaces should be cleared and made available when the rest of the lots are being cleared and ideally, as soon as possible. 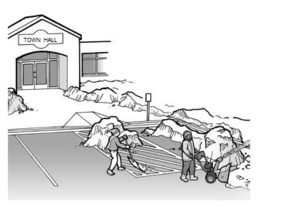 Accessible parking spaces should not be used to collect snow for later removal! This is worth repeating. Accessible parking spaces should not be used to collect snow for later removal! Please note that snow-covered spaces STILL do not mean that you can park in available accessible parking spots if you do not have an Accessible Parking Permit. A single wheelchair requires at least a 36" path, therefore please ensure a path that is at least this wide. Clear passages should include curb cuts. Please help by sharing this information with business owners and the public so New Fairfield is accessible for all during the winter months.